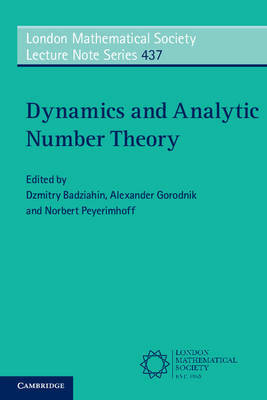 Written by leading experts, this book explores several directions of current research at the interface between dynamics and analytic number theory. Topics include Diophantine approximation, exponential sums, Ramsey theory, ergodic theory and homogeneous dynamics. The origins of this material lie in the 'Dynamics and Analytic Number Theory' Easter School held at Durham University in 2014. Key concepts, cutting-edge results, and modern techniques that play an essential role in contemporary research are presented in a manner accessible to young researchers, including PhD students. This book will also be useful for established mathematicians. The areas discussed include ubiquitous systems and Cantor-type sets in Diophantine approximation, flows on nilmanifolds and their connections with exponential sums, multiple recurrence and Ramsey theory, counting and equidistribution problems in homogeneous dynamics, and applications of thin groups in number theory. Both dynamical and 'classical' approaches towards number theoretical problems are also provided.